This Egyptian belt for men is perfect as the finishing touch for a Pharaoh costume or as part of an Egyptian king costume. 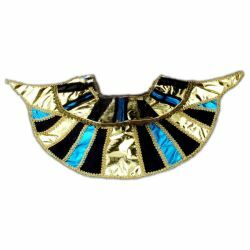 It can be used to create an Egyptian costume that is unique to you when you pair it up with our other Egyptian period costume accessories. The Egyptian belt for males is colored as pictured and is one size fits most.